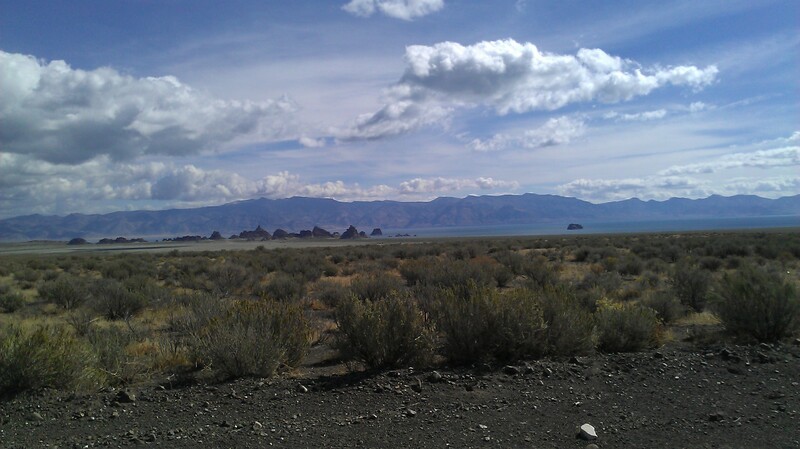 Pyramid Lake to Black Rock Desert- in three parts. This route has gone from a three part ride over a month’s time to a three part ride over nearly two years. So many miles between the first leg of this tour in September, 2014 to finishing it in June, 2016. I think this is an outstanding route from Pyramid Lake to the Black Rock Desert. Raymond and I both used the same bikes with some changes of the years, he on his Soma Saga and me on my Salsa Fargo. The conditions are outstanding and the views are fascinating. If you have the opportunity to visit this area in northern Nevada – take it! It will open your mind to the desert! Part 1 Sutcliffe, Pyramid Lake to Round Springs, Smoke Creek Desert. All in wild Northern Nevada! This tour idea evolved from originally wanting to do a day tour of gravel roads from Pyramid Lake to Smoke Creek, about an 80 mile out and back in western Northern Nevada. I was hoping Smoke Creek would prove to be a small stream worthy of fishing possibilities. The destination held such promise and I had no idea how beautiful the landscape would be on this trip. I had made a couple of trips out to Pyramid Lake to bike, fish, kayak, and play tour guide for visiting relatives but I had never ventured off the black top. 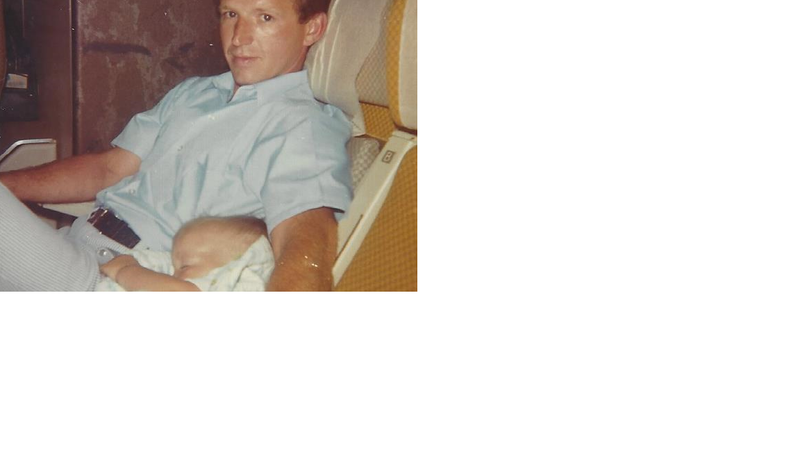 My riding partner was Raymond Eliot, an experienced bike tourist, and now a seasoned “gravel grinder”. We joke about this term entering the parlance of bicyclists. He rode his Soma Saga over these hundreds of miles of dirt roads. Ray is a great touring partner, willing, chatty, thoughtful, and able to push through when we have bit off more than we can swallow of bumpy dusty roads. It is a great test of a touring partner when the moment comes during a day of riding, it’s as if the switch is flipped, and the fun becomes work. The free flowing conversation dies, heads drop, and progress is measured in yards and minutes. Ray stands up to the test. I confess I continue to test him by pushing our rides further. While this tour would have made an excellent multi-day tour we broke it into a series of day trips. Planning water re-fueling stops would have been the biggest challenge of this trip. Nevada is where water goes to die. Pyramid Lake is on Paiute Tribal Lands. Once we obtained a parking permit ($6) we were off! 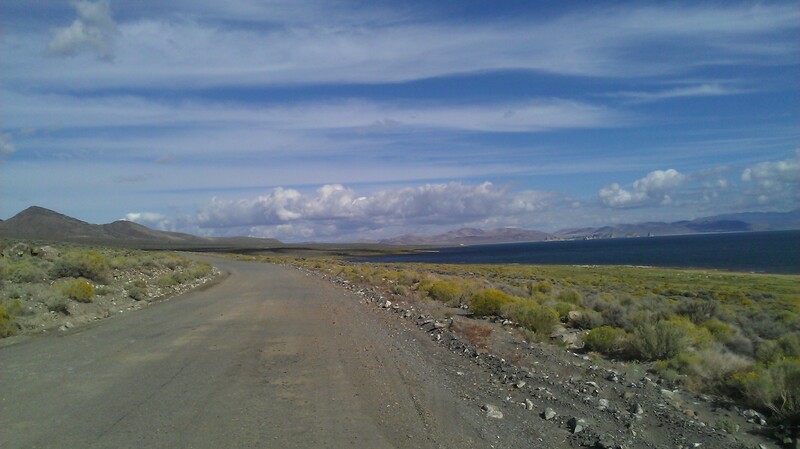 The first 9 miles were on paved Nevada Route 445, Pyramid Highway, with the Virginia Mountains (the name I confused with the Virginia Range located on the east of Reno) on our left and Pyramid Lake on our right. 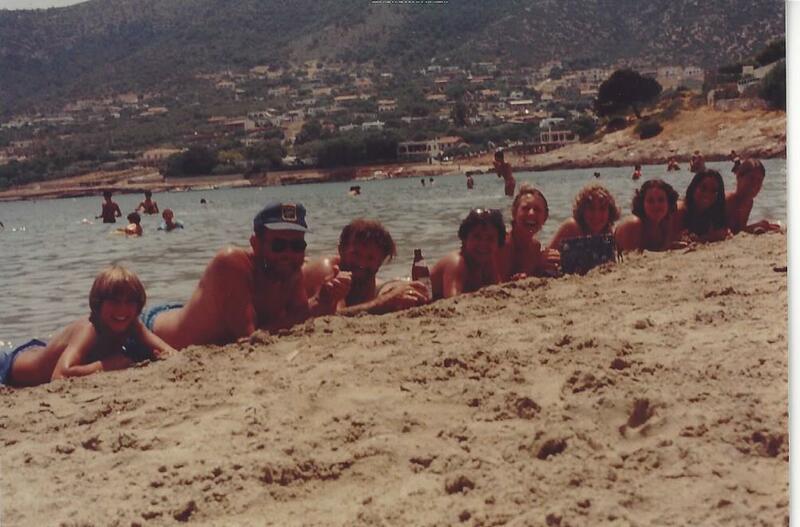 Every few miles were turn-offs down to the beach where you are welcome to camp. Once we were on dirt the road turned wash-boardy. I was not particularly surprised nor put off by this though. The washboard was not the worst I had ridden but probably the longest. The dirt road changes its name to Surprise Valley Road. Along the road is an old rail way bed. It would be exciting to see this become a rails-to-trails project but I don’t know if the area could attract enough visitors to make it worth while. The next closest rails-to-trails is Susanville, CA’s Biz Johnson Trail. We only encountered less than one vehicle per hour on our tour but if we could ride on a designated trail the trip could only be that much better. We passed a ranch house along a wash complete with cows, horses, giant cottonwood trees, fences and irrigation. Presence of water was punctuated by a green ribbon snaking down from the hillsides with a ranch house and or livestock chutes. Water as a highly coveted resource in the high Northern Nevada desert is played out throughout the history of Pyramid Lake, the Truckee River, and their inhabitants. The tufa formations along the lakeshore are a natural curiosity. Along the northern shore are the Needles, a sacred and closed portion of Pyramid Lake. Washington and Monument Rocks are awesome opportunities for close up inspection of tufa. Leaving Pyramid there are signs for the Pyramid Reservation Geothermal plant. But we couldn’t see evidence of it from the road. Beyond that we were off the reservation. A short distance from here were a couple of routes to the west to the California boarder and Highway 395. The road conditions improved. 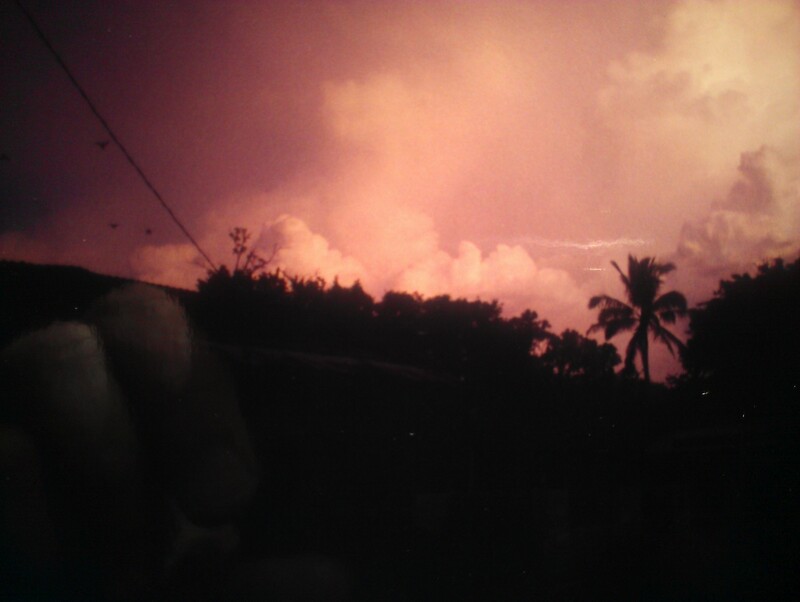 Most notable were the small playas along the Southern Pacific side spur. Beyond the abandoned Southern Pacific buildings we descended to the Smoke Creek Desert. We ended our first day at the Round Springs hot springs site. This was short of my original goal of reaching Smoke Creek but that will be day two. Leaving the Round Springs sulphur scented hot springs we had a short ride to Smoke Creek. 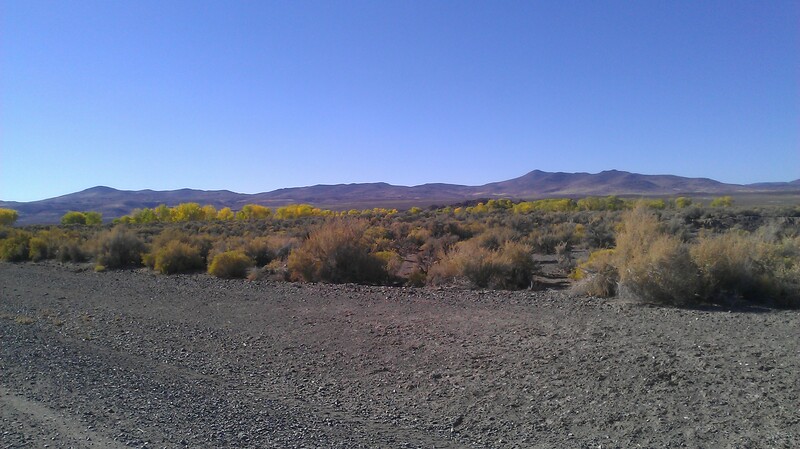 The northern Nevada landscape is not empty. We passed several ranches on this leg of the tour. 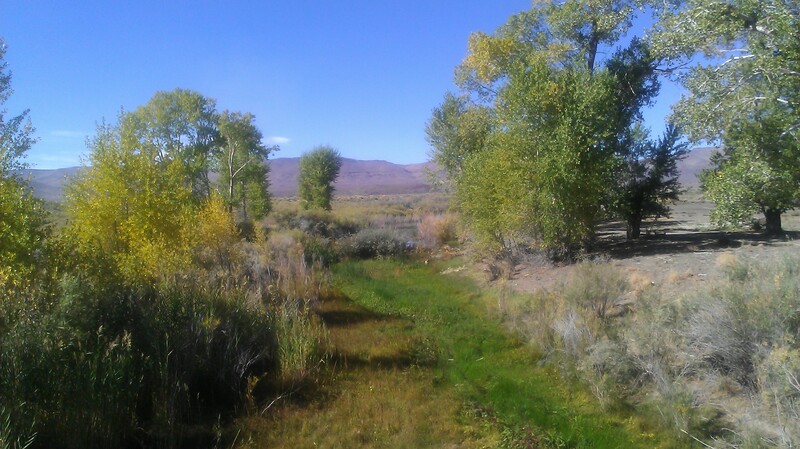 The Smoke Creek Ranch had damed the creek creating a small pond before the water disappeared into the Smoke Creek Desert playa. I was hoping Smoke Creek would be a possible fishing location but I think the ranch has limited its access. The vastness of the Smoke Creek Desert was startling. It is easy in our area to think of the Black Rock Desert as the only huge playa or Lake Tahoe as our primary big lake but this trip has showcased Pyramid Lake and the Smoke Creek Desert as none lesser. The mountain peaks bordering these pancake flat features make me wonder what canyons and ridge lines are waiting to be explored. The mountainscapes were in all shades of browns and with as many textures. We saw barred over hard rock mines as well as golden ribbons of trees in Fall color. Our speeds were good with less elevation change on this leg of the adventure. We ended the ride at a microwave antennae at the north end of the Smoke Creek Desert. 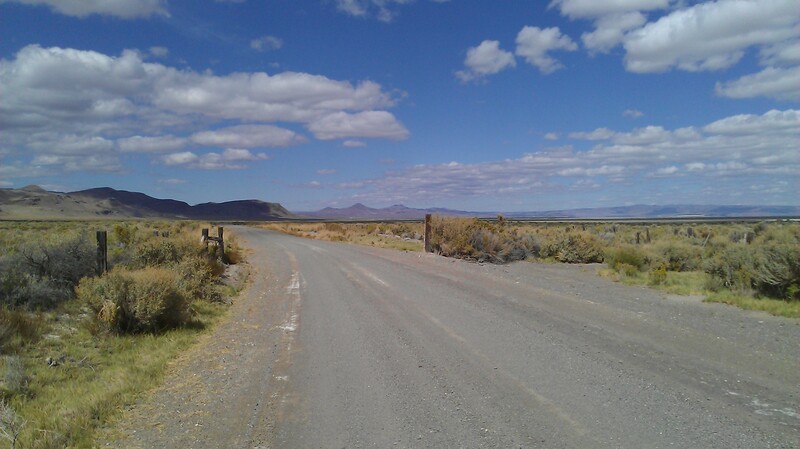 We were due west of Gerlach, the town at the south end of the Black Rock Desert. This will be the launching point for the third leg of our trip. Northern Nevada was experiencing a bit of a heat wave in early June. Instead of the warm temps in the 80’s we were experiencing a 10-15 degree jump. But in order to take advantage of a day off Raymond and I made the drive out to the radio tower at the north end of the Smoke Creek Desert. We covered the route we had already ridden out and back. We made a couple of stops including the bridge over Smoke Creek and at one point saw a prong horn antelope near the road. Once we were on the bikes we were surprised how quickly Smoke Creek Road ended. Before we knew it, about 5 miles, we were on paved highway 447 just 10 miles from Gerlach. Our ride was bordered by the Burro Hills to the northwest and the Smoke Creek Desert to the southeast. The road signs indicated we had come about 75 miles from Sutcliffe at Pyramid Lake. It was a bit disappointing to be on pavement but we made good time to the Black Rock Desert. We passed a historic trail marker for the Nobles Trail. I want to get the maps provided by trailswest.com that outline the emigrant trails across Nevada. Often I plan my trips based on a particular geographic feature but to follow the emigrant routes while reading their accounts would be fascinating. Just outside of Gerlach we came to the ridge that separates the two deserts, The Black Rock to the east and Smoke Creek to the west. The Fox Range creates the eastern and southern boundary of Smoke Creek Desert. The Southern Pacific Railway runs along the east side of the playa with accompanying dirt roads. Future plans will explore these roads and the Fox Range. This was my first outing seeing wild burros. We had just passed Burro Mountain. Buffalo Hills are in the background. We didn’t see buffalo, not too surprising. The terrain on the west side of Smoke Creek Road is rich in named features, such as Crooked, Wrangler, Stockade, Poodle Mountain, and Chicken Canyons. To continue west to Squaw Creek Reservoir and explore these canyons will be a future ride in this area. We made it to the visitors information center for the Black Rock Desert to be well informed by the outside kiosks. We entered the playa at the 3 Mile entrance. The vastness of the playa makes you do silly things like ride no handed with your eyes closed. The lack of immediate points of reference tests your ability to navigate by distant features on the horizon. We only rode a few miles out on the playa aware of needing to get back to our vehicle in the heat of the day. This end of the playa is known for being the wet end. Raymond’s 40 mm wide tires did pack up in his fenders when we tempted fate along the south west edge of the playa. After a bit of scraping we exited the playa on dry ground. Day three was only a 40 mile day but in 90+ degree weather. The temperature couple with 100% exposure took its toll. The Nevada sun should not be underestimated. From the Black Rock Desert there are great routs to explore in all directions. Squaw Creek, Soldier Meadows, Sheldon Wildlife Refuge, the Pine Forest Range, and Jungo Rd to Winnemucca are all on my long term goals for rides in the area. I wish I was not too old so I could ride a bike like Kurstin’s. I have seen many breath-taking spots around the world, but these are mind stopping. MORE!